"Langur" redirects here. For places in Iran, see Langur, Iran. The Colobinae are a subfamily of the Old World monkey family that includes 61 species in 11 genera, including the black-and-white colobus, the large-nosed proboscis monkey, and the gray langurs. Some classifications split the colobine monkeys into two tribes, while others split them into three groups. Both classifications put the three African genera Colobus, Piliocolobus, and Procolobus in one group; these genera are distinct in that they have stub thumbs (Greek κολοβός kolobós = "docked"). The various Asian genera are placed into another one or two groups. Analysis of mtDNA confirms the Asian species form two distinct groups, one of langurs and the other of the "odd-nosed" species, but are inconsistent as to the relationships of the gray langurs; some studies suggest that the gray langurs are not closely related to either of these groups, while others place them firmly within the langur group. There are two major forms of the Colobinae, the Asian Presbytin and the African Colobinae. The African Colobinae are the closest living relative to apes. On the other hand, the Asian Presbytin are more geographically diverse and populated. However, through deforestation and hunting, the Colobinae are becoming an endangered species. Colobines are medium-sized primates with long tails (except for the pig tailed langur) and diverse colorations. The coloring of nearly all young animals differs remarkably from that of the adults. Most species are arboreal, although some live a more terrestrial life. They are found in many different habitats of different climate zones (rain forests, mangroves, mountain forests, and savannah), but not in deserts and other dry areas. They live in groups, but in different group forms. Colobines are folivorous, though their diet may be supplemented with flowers, fruits and the occasional insect. To aid in digestion, particularly of hard-to-digest leaves, they have multichambered, complex stomachs, making them the only ruminant primates. Unlike the other subfamily of Old World monkeys, the Cercopithecinae, they possess no cheek pouches. Gestation averages six to seven months. Young are weaned at about one year and are mature at three to six years. Their life expectancy is approximately 20 years. Intergeneric hybrids are known to occur within the Colobinae subfamily. In India, gray langurs (Semnopithecus spp.) 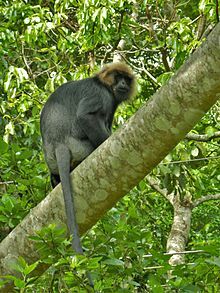 are known to hybridize with Nilgiri langurs (Trachypithecus johnii). Wikimedia Commons has media related to Colobinae. ^ a b Groves, C. P. (2005). "SUBFAMILY Colobinae". In Wilson, D. E.; Reeder, D. M. Mammal Species of the World: A Taxonomic and Geographic Reference (3rd ed.). Johns Hopkins University Press. pp. 167–178. ISBN 978-0-8018-8221-0. OCLC 62265494. ^ a b Sterner, Kirstin N.; Raaum, Ryan L.; Zhang, Ya-Ping; Stewart, Caro-Beth; Disotell, Todd R. (2006). "Mitochondrial data support an odd-nosed colobine clade" (PDF). Molecular Phylogenetics and Evolution. 40 (1): 1–7. doi:10.1016/j.ympev.2006.01.017. PMID 16500120. Archived from the original (PDF) on 2008-12-17. ^ Osterholz, Martin; Walter, Lutz; Roos, Christian (2008). "Phylogenetic position of the langur genera Semnopithecus and Trachypithecus among Asian colobines, and genus affiliations of their species groups". BMC Evolutionary Biology. Springer Nature. 8 (1): 58. doi:10.1186/1471-2148-8-58. ISSN 1471-2148. PMC 2268674. PMID 18298809. ^ Rowe, N. (1996). The Pictorial Guide to the Living Primates. Pogonias Press. pp. 139, 143, 154, 185, 223. ISBN 978-0-9648825-0-8.